hey, everyone! today i have the next installment of the Nicki Minaj collection... Pink Friday and Super Bass Shatter. unlike all the previous OPI shatter releases, this purple shatter has a cutsie name instead of just calling it by the color combined with shatter, ie, black shatter. honestly, i prefer the ones simply named by their color... makes it much easier to remember which ones you have... at least for me! Pink Friday is a bubblegummy Pepto Bismol pink. it's not very original, but it's also not a total dupe for anything in my collection. i used three coats to make everything even out completely, but it's thin and dries quickly so three coats is not a problem. excuse the cuticle boo boos... i'm still not used to how close up and clear my new camera shoots. even things i didn't really notice in person jump out and slap you in the face in the photos! this is three coats topped with two coats of Seche Vite. speaking of Pepto... i just had to add in a shot with the bottle... perfect match! here's Super Bass Shatter. excellent formula, it even allowed me to go over bald spots again and still crackle nicely. it's a shimmery grape color... more like a grape lollipop than an actual grape. not sure how well it would show up over a darker color, my guess is that it would be sheer, just like Pink Shatter. i really HATE purple and pink together, but i LOVE this combo! it is so gorgeous and fun in person. i will definitely be rocking this again, i was actually disappointed to take it off, which is rare because after one day i usually am bored with the current color. 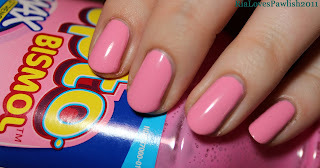 this is one coat layered over Pink Friday and topped with one coat of Seche Vite.